Hi there! Thanks for stopping by. I’ve put together a comprehensive list of ways bed wedges can help along with their benefits. The first and most important distinction I would like to point out is that there is a difference between a wedge pillow and bed wedge. A wedge pillow is a foam pillow that elevates only the user. While a bed wedge elevates either the whole bed or the mattress. Today we’ll be discussing the benefits of the latter. We’ll be looking at how you can benefit from a bed wedge. We’ll also be exploring different angles. An in-depth perspective from the scientific community’s point of view. What Ancient Eastern medicine has to say about sleeping upright. And finally, the result yielded by the experience of everyday users. Please keep in mind that some of the benefits are common for wedge pillows also. According to this Harvard Health blog, sleeping on an incline eases the pressure on the Lower Esophageal Sphincter (LES). The LES is a small valve at the bottom of the food vessel that prevents the stomach acid from making its way back (reflux) up the esophagus. In this GERD Article done by the Digestive Health Center of the University of Virginia a bed wedge is beneficial. Elevating the head of the bed by at least 6 to 8 inches prevents reflux. They also point out a very important detail. Using a couple of pillows under your head only will not work. it might even cause more harm than good. They say the whole mattress should be elevated. The University of Washington Medical Center in their Silent Reflux: Laryngopharyngeal Reflux Disease article, they strongly suggest raising the whole bed. They say that pillows, if not used properly can cause neck and back pain. The University of Rochester Medical center in their Heartburn article also recommend a bed wedge amongst other tips to ease nighttime heartburn In their article, they also talk about a wedge pillow. Mayo Clinic in the Patient Caer & Health Information section has an article on Gastroesophageal Reflux Disease. They mention in the Lifestyle and home remedy section to elevate the head of the bed. It may reduce the occurrences of acid reflux. It saves you money. By lifting the whole bed up, you and your partner can enjoy the benefits of sleeping on an incline. You can do it yourself (DIY) using blocks of wood or bricks. You can insert the blocks of wood and/or bricks under the head of the bed – only if you own a full frame bed – This will naturally tilt the bed at no extra cost for you. Users have experienced relief by using a bed wedge for sleep apnea. This WebMD article shows that it can help in opening the airways. When lifting the whole mattress, the change is barely noticeable. In other words, the adaptation period is very short. You will get used to it almost instantaneously. Gravity helps unclog the Ear, Eye and Nose area. Many bed wedge users experience relief from post-nasal drip. Specially for those who have allergies. Meant to fit between the mattress and box spring, the Beautyrest Mattress Elevator will elevate your mattress itself, giving you an easy, gradual slope and no unfamiliar wedge pillow on which to sleep. It is made of polyurethane foam fabricated in the USA, and the price varies depending on bed size. The wedge’s placement is under your mattress instead of on top of the mattress, so the only change you will experience is the elevation, which is relatively slight due to the long slope of the wedge pillow (which runs the length of the bed). The comfort of the material is therefore irrelevant, as you won’t be sleeping directly on it, and you can continue using your favorite pillow on top of your regular mattress. Many have had very positive reactions to using this bed wedge and have not experienced any compression of the wedge/elevator itself. The wedge is also under warranty for up to 90 days after the date of purchase. The slope of the wedge is fairly gradual, only five inches tall at its highest point. While this may be comfortable for sleeping, it may not be enough of a positional adjustment to entirely eliminate acid reflux symptoms. 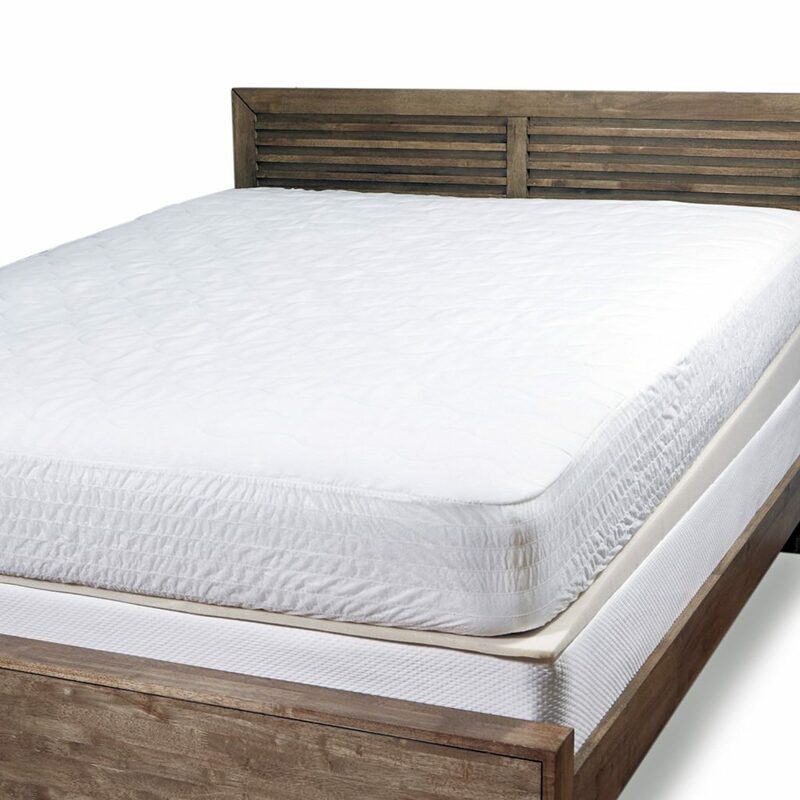 Additionally, this may be a difficult pillow to use if your bed has slats beneath the mattress instead of a box spring, as it will not be evenly supported across its surface area. It is also recommended that the wedge pillow unfurl and air out for a day or two prior to use; otherwise, it has been said to smell or compress. This wedge pillow seems to satisfy customers with its gentle elevation and durable foam and relative lack of change to their normal sleeping arrangement, although it is one of the pricier options, particularly if you have a king bed. However, with consistently high ratings, it very well may be a worthwhile investment. You may want to check with your partner first, though, since it affects the whole bed! Advertised as working well with any mattress, thick or thin, the Mattress Genie is essentially a thin plastic balloon that inflates into a bed wedge (for use beneath your mattress). 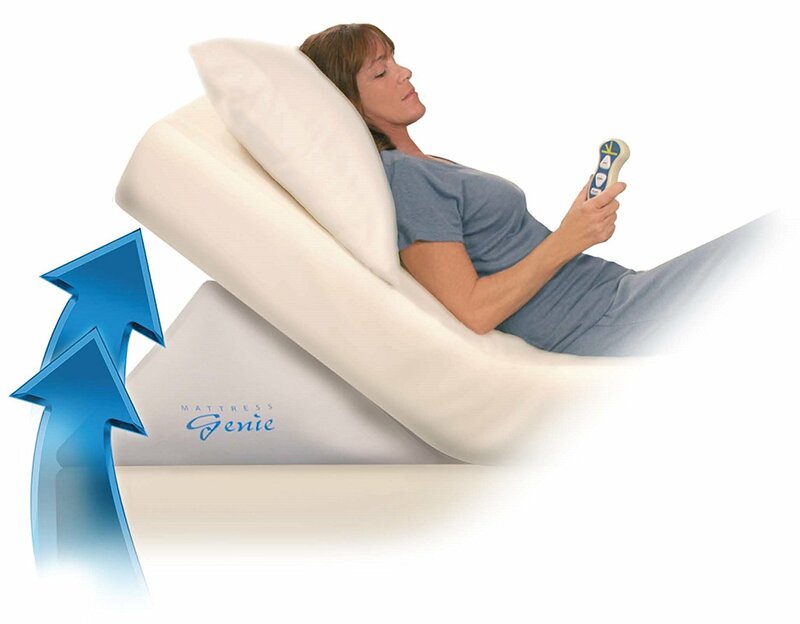 This might be the perfect product for you if you’ve tried a wedge pillow before and thought, “If it were only a few degrees higher…” or “I wish I could adjust this just a little.” The Mattress Genie puts the power in your hands and, with the click of a button, allows you to do just that. This device is the ultimate in customization, allowing you to explore different degrees of incline and elevation in order to find one that works well for your specific symptoms and body. Because the wedge deflates, it is also easy to bring on trips – even carry-on luggage. Because the Mattress Genie is used as a bed wedge and not a pillow, it won’t separate you from the mattress you’re used to. The incline customization may also be useful post-surgery or for reading or watching television in bed. Due to the potentially steep incline (it can raise your mattress up to 26”), you may experience sliding; your mattress may even slide down if you don’t have a footboard, or it may slide to one side if the Mattress Genie is not in the exact center of the mattress. Additionally, some setup is required – inflating the wedge – although it is said to take less than three minutes. The inflation an also be noisy, so you may not want to do it in the middle of the night. The Mattress Genie also has been said to have an unpleasant plastic smell when first unpacked, and some customers have experienced deflation. There is also no warranty specified, although it might be indicated in the packaging. The Mattress Genie has received mixed reviews, but the people who love it really do swear by it. The push-of-a-button ability to inflate or deflate the Mattress Genie also means that your GERD doesn’t have to change the look of your bed when you’re not in it. You can adjust the incline whenever and however you’d like, which is a huge benefit. You will, however, need to be precise in your placement and be sure that your mattress is pliable enough to bend.